Ford GT was created on the base model of Ford GT40 race car, which in 1966 LeMans race beat all of its competition - the best racers with best racing cars in the world. The fact that it can be driven on the highway as well as on the race-track is really amazing. This car does not use any special aviation fuel like most of the supercars and yet it is known to outperform it's rival cars like the Porsche, Ferrari or Lamborghini. 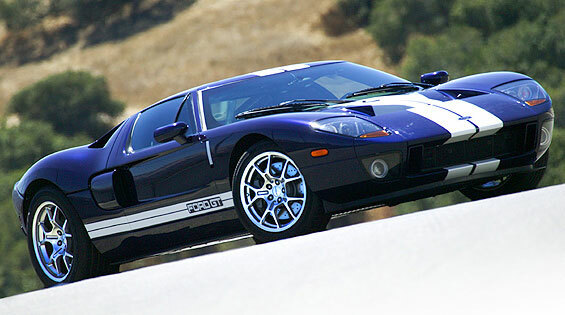 Ford Motor Company has decided to produce only 4200 GT sports car units in the 2005-2006 years. Depending on chosen accessories, retail price varies from $143,000 to $157,000. Ford GT is really incredible when it comes to its racing performance. In 0-60mph test GT (3.3 sec) beats a $193,000 Ferrari Challenge Stradale (4.0 sec) by 0.7 seconds. Ford GT features 18-inch front wheels, 19-inch rear wheels and GoodYear Eagle F1 Supercar tires. All GT models share one common design element, which makes their exterion look so amazing. The doors are cut into the roof of the car, this fact gives itr a very specific and exotic look. If ever a car's design said "thrash me to an inch of my life", it's the Ford GT's. From its hood's chiselled air vents, to the slightly flared rear wheel arches, to the massive, muscular rear end; the low-slung domestic supercar is a perfectly realized expression of balls-out speed. Sure, it's a pastiche of the LeMans-winning GT40. And? If someone could make a modern version of the [Ferrari-attributed] Dino 246, I'd want to drive the Hell out of that too.